Winter Clinic dates announced - Sign up here! Penn State is proud to announce the dates for the 2015 High School Boys and Girls Winter Clinics. The weekends will be led by Penn State Director of Rugby, Chris Amoratis, and Women's Head Coach, Kate Daley. Supporting Chris and Kate will be the rest of the Penn State Rugby coaching staff and current players. "Campers will have the opportunity to interact with the current Penn State players," said Coach Daley, "and acquire an understanding of what playing rugby and studying at a university entails." "We squeeze over 8 hours of on-field instruction into a weekend. It culminates with scrimmages," said Coach Amoratis. "There is no better way to kick off your spring season. 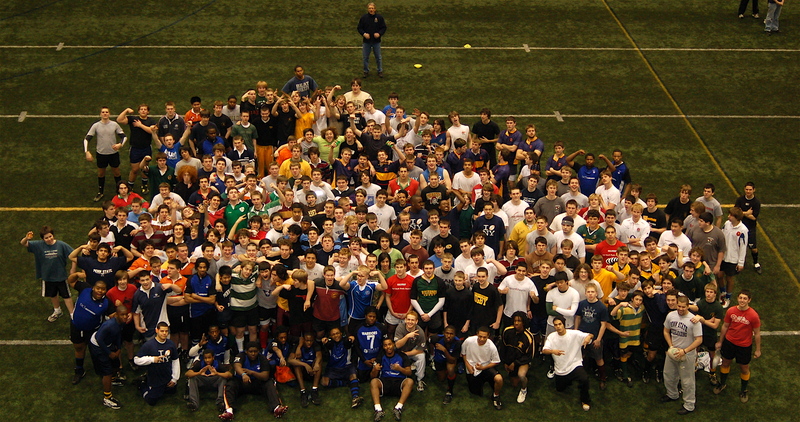 We hold our field sessions inside Holuba Hall, an 118,000 square-foot indoor turf field. We have had 6 inches of snow on the ground and 10-degree temperatures and still have been able to hold the clinic in warmth." With 4 sessions of on-field instruction, lectures, video-analysis and live match-play, Penn State Rugby strives to give attendees the best, most functional rugby experience available. The Penn State staff work to share the best knowledge of the sport of rugby, as well as impart the importance of a college education. At Penn State, we believe that these are not mutually exclusive. The Boys Clinic will be held the weekend of February 20, 2015, and the Girls Clinic will be held the weekend of February 27, 2015.